University students are charting their careers and making a difference in the community, thanks, in part, to insight they gain from a nationwide leadership program. Four Palm Beach Atlantic University students have been named Campus Compact Newman Civic Fellows over the years, with senior Judson Crawford completing the fellowship this semester and freshman Melody Bohannan recently named to the 2019-2020 cohort. Isabelle Runge ’18 and Lexi Redmond ’18 also were Newman Civic Fellows. The PBA students learn alongside other fellows from Ivy League schools and large research universities. Fellows are nominated by their university president or chancellor based on their potential for public leadership. In the fall, all of the fellows gather in Boston for a nationwide convention hosted by Campus Compact and the Edward M. Kennedy Institute for the U.S. Senate. The program also includes webinars on skill development, leadership development with a local mentor and networking with other engaged student leaders. For Crawford, the experience helped him discern his career goal of becoming a police officer. Officers can make a big difference in children’s lives, a lesson Crawford said he learned as leader of the Rosemary Village afterschool program. Rosemary Village is an underserved, low-income community two miles from campus. Tabernacle Missionary Baptist Churchruns the afterschool program for children ages 4 to 15, Crawford said. 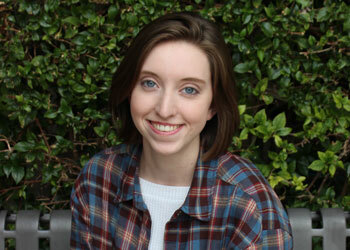 The psychology major will attend the police academy in St. Augustine in July. His long-term plan is to become a psychologist for first responders. The Rome, Georgia, native came to PBA as a transfer student his sophomore year and learned about Workship, the university’s community service program. That’s how he got plugged into the afterschool program that set the trajectory of his college career. From that day on, he went every Monday, Wednesday and Friday. In his senior year, he’s volunteered two days a week. He has planned weekend events such as a PBA campus visit, bowling and a zoo trip for the children. He hopes to take them gleaning, for “a really cool, hands-on experience” and so that they can see where their food comes from. The church invited Crawford and his mentor to a Black History Month service, during which Assistant Pastor Rev. 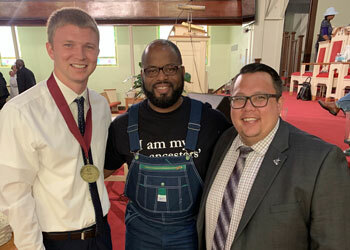 Kevin L. Jones ’07 presented Crawford with his medal from Campus Compact. Nathan Chau, assistant director of Workship, served as Crawford’s mentor for the fellowship, which trains students in developing leadership qualities, recruiting and encouraging volunteers and recognizing and meeting community needs to create a new vision for the future, Crawford said. Bohannan, PBA’s next Newman Civic Fellow, met a need for volunteers for an English as a Second Language (ESL) program for parents at Belvedere Elementary School. She plans the lessons and designs worksheets for parents to do during school breaks. The intercultural studies major improved learning by bringing in household objects to illustrate her lessons, which enhanced parents’ language skills and helped them gain confidence – an achievement PBA President William M. B. Fleming, Jr. noted in his nomination. Before she came to PBA, the Rockledge, Florida, native lived in Bolivia and Peru, where she taught English to girls. In that time, she experienced what it’s like to not know the language or what’s going on in one’s surroundings. “The biggest thing it showed me was the life of an expat or an immigrant can be really hard,” she said. She hopes the fellowship gives her the skills to strengthen the ESL program and sets her up to work at an orphanage or start her own ministry in another country after graduation. “This could be the tool to help me do that,” Bohannan said.